- A short description of the element. - The table of properties. - Useful methods. Interface elements. These are the elements used to build your interface. These elements are based on standard Java (Swing) interface elements such as windows, panels, and buttons. 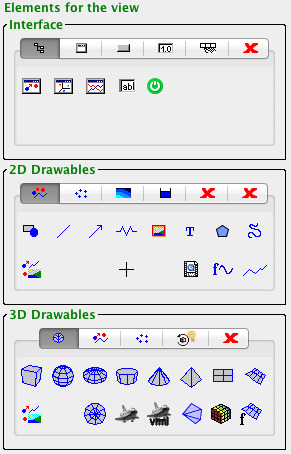 2D Drawables. These are drawable elements for two-dimensional panels. As such, these elements can only be children of 2D drawing or plotting panels. 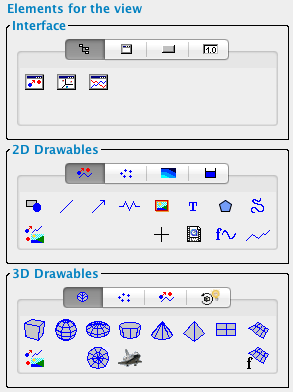 3D Drawables. These are drawable elements for three-dimensional panels. As such, these elements can only be children of 3D drawing panels. HTMLView. Read here about the Simulation view node of the HTML view, the root node for all other elements. Interface elements. These are the elements used to build your HTML interface. These elements are based on standard HTML5 interface elements such as panels (divs) and buttons. We have also added special purpose Drawing panels (based on SVG drawing). 3D Drawables?. These are drawable elements for three-dimensional panels. As such, these elements can only be children of 3D drawing panels.